TURN ABOUT PEGASUS offers a range of activities to suit the diverse needs of participants. We welcome your interest and any other enquiries. We look forward to working in partnership with you. Animal Assisted Play Therapy encompasses all age ranges to provide a unique therapeutic approach which is playful, fun and safe utilising a long established evidence based therapeutic intervention delivered by a British Association of Play Therapy qualified Therapist Tracie Faa-Thompson who is Co-founder of the International Institute of Animal Assisted Play Therapy. We offer the opportunity of carrying out activities in an outdoor rural setting with plants and animals; all of which have enormous benefits to health and wellbeing. Content, pacing and progression of activities are individually tailored to clients’ interests and abilities. Focusing on personal and educational development we offer a range of activities individually geared towards employablity, Personal and Social Development and Independence. 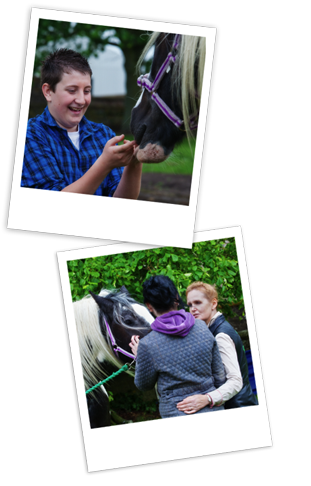 Provides the opportunity for people to work in true partnership with horses to learn ethologicallyresearch based body language and communication. To gain new transferable skills to better read human non verbal language, increased confidence and better social relationships. Qualified registered therapists facilitate tailor made sessions for a range of clients needs and issues in a professional non-threatening ethical environment. Focusing on social education to assist with enhancing relationships both human and animal. Learning to care and relate to animals whilst linking their learning into key educational skills such as numeracy, literacy, sciences and practical skills. Funded and supported by way of assisting with the purchase of a JCB digger and eco toilet EU and NULAG LEADER. Interested in volunteering? visit our TRAINING page to see the many ways you can support us.